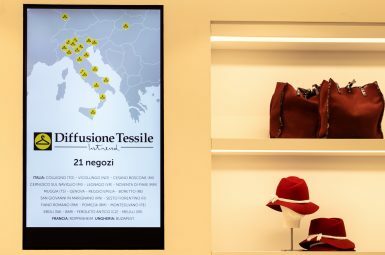 Founded in 1996, Diffusione Tessile is one of the most influential outlets in the women’s high-end clothing market. The strategy combines a wide range of products with the quality of services found in the most prestigious prêt-à-porter boutiques. Driven by a customer-centric mindset and an innovative spirit, in the past years the Group has invested large resources in the back-end and front-end to make processes more efficient and diversify the services for the customers. By introducing RFID technology, the management has made the managing of stock, and the tracking of the products along the entire distribution chain, more efficient. 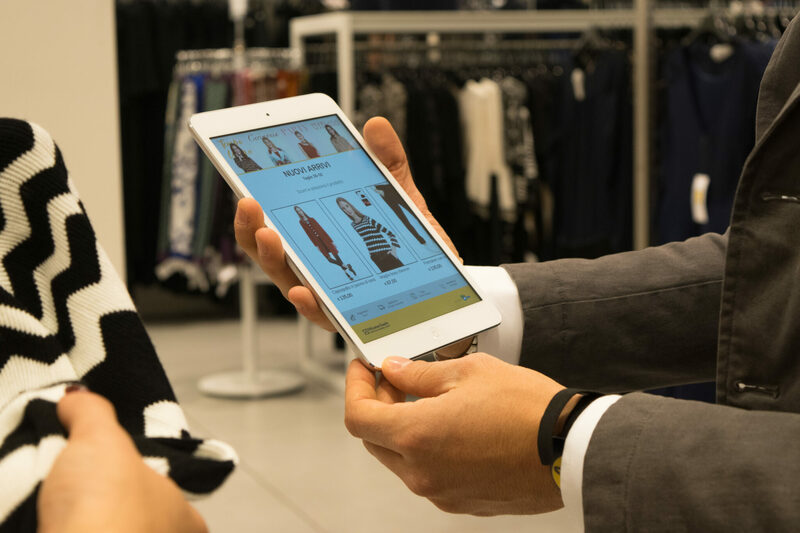 Another area of development has been the digitisation of the products’ catalogue, the redesigning of the e-commerce website, the improvement of the CRM system connected to the data collection projects, and the development of a sales and stock management APP to support sales personnel. 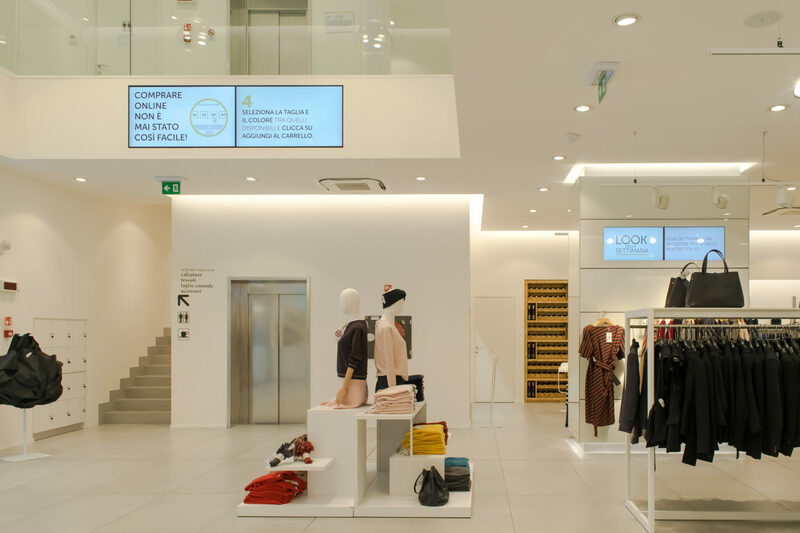 Since 2017, the group has turned its attention to the physical stores with a multichannel experience view, introducing digital innovation to improve communication and customer service. Improving the in-store communication through digital signage. Improving the shopping experience through a number of added value services. Improving the sales support tools available to the staff. M-Cube, as a company specialised in Digital Signage, Digital Asset Management (DAM), Audio and Digital Engagement, was involved from the start in the brainstorming process. By using creativity to shape the new services, and digital technology as a means to engagement and relationship, the development team has created a highly integrated system of communication and customer assistance. 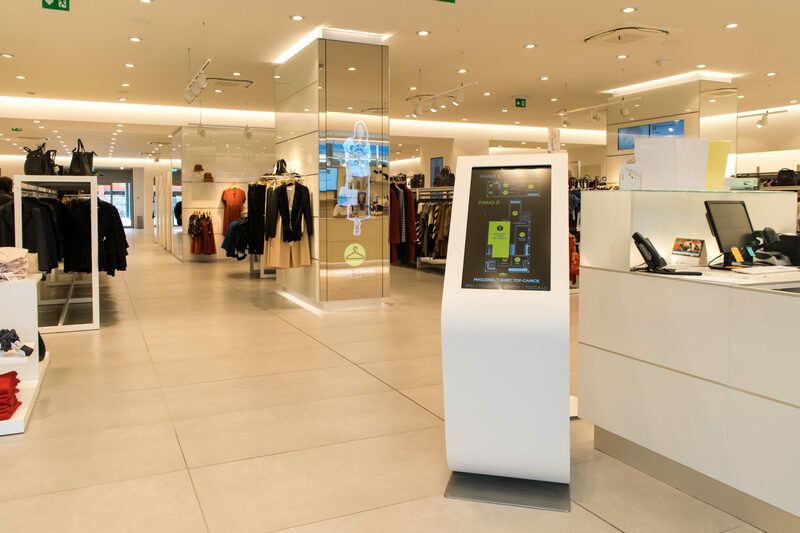 The concept is based on digital contact points that accompany the in-store customer journey through contents designed to convey information, promotions, and call to action in a dynamic and efficient way. Wayfinder is the store mapping solution that helps customers find their bearings in particularly large stores. 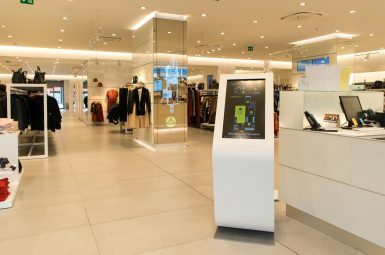 The totem has a touch screen that allows customers to view the store layout. By touching the different areas on the map one can locate the products areas. Alternatively, it is possible to search the menu for the desired item. Magic Mirror is a high-impact solution, being both a mirror and a digital signage solution. It is used to show the total looks of the new collections and items available in the store. Size-point: here the customer can check whether the desired item’s size is available. In the past there could be long queues of waiting customers. Today, thanks to this simple innovation, the customer can carry on shopping while waiting to collect the item. 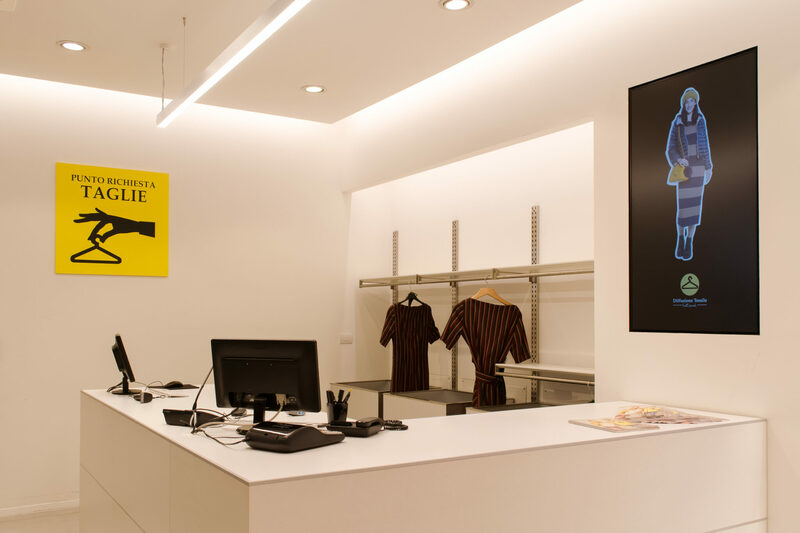 At the size-point counter the customer is given a wrist band with a number that will appear on all 55” displays around the shop. When the number changes from red to green the item is ready to be collected. Endless Aisle: through an APP developed by Diffusione Tessile, sales staff can access the CRM system from the tablet and see the buying history of the customer. They can also access the stock manager and the digital catalogue of all products. 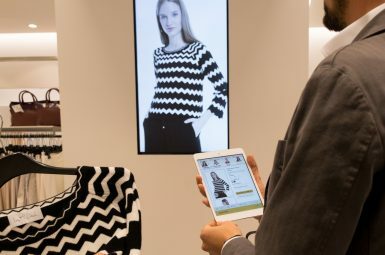 In line with the customer’s preferred style It is then possible to suggest a selection of articles, and the images can be shared from the tablet with any of the 55” screens present in the store. The full-size high-definition images make the presentation of the article more appealing. The purchase can then be made directly through the tablet, and if items are not available in the store, their delivery at home or in the shop can be arranged. 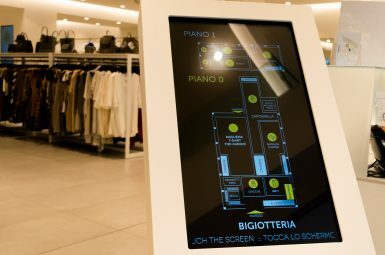 The solutions have been tested in the new outlet in Genoa, that has become a true “experience lab”. The opinions of the staff and customers were collected and used to fine tune the functions of each service according to the preferences expressed. The standardization has been programmed to put into effect the implementation in all the Group’s stores. We had lots of ideas to make life inside our stores more pleasant, but it was difficult to put them into effect. The contribution of M-Cube has been fundamental: they not only brainstormed and developed the new projects with us, but they guarantee us assistance for the hardware maintenance, and for the definition of the contents.The positive experience in Genoa has convinced the management to extend the investments to all our stores network, and to start on new projects. M-Cube has proved to be the ideal partner, following all aspects of the project. enhanced the customers experience and improved the customers loyalty process, introducing a value added infotainment, both from a practical and a sensory point of view. Improved the in-store itinerary, making it easier to search for items, look for information, and access services. Made the employees work more efficient, turning sales assistants into personal shoppers. 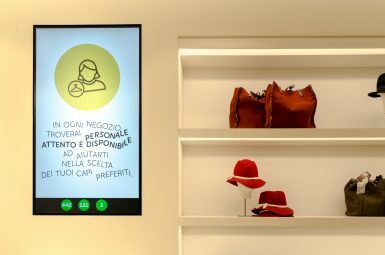 Improved the in-store communication in support of customer service and the omnichannel strategy of the Group.